Nathaniel Dresden, aka "Natty Dread," never really got along with his father, an infamous civil rights lawyer who defended criminals and spearheaded protest movements. As an act of rebellion, Natty joined the U.S. Army and served in Iraq, coming back with a chest full of commendations and a head full of disturbing memories. But when his father is found murdered near the peaceful confines of Brooklyn's Prospect Park, Natty is forced to deal with the troubled legacy of their unresolved relationship. He also has to fend off the growing suspicions of Detective Lourdes Robles, a brash Latina cop with something to prove, who thinks Natty might bear some responsibility for his father's death. The search for answers leads them both into an urban labyrinth where they must confront each other—and brutal truths that could destroy each of them. "A great thriller...I just kept turning the pages...I loved Natty Dread." "Exceptional...Blauner’s characters are complex and his prose is as impressive as his plot. His gritty portrayal of urban crime recalls the work of Richard Price and Dennis Lehane...A statement about the horrors of war and the way they endure." "Edgar-winner Blauner hasn't lost his touch, as this page-turner demonstrates... Blauner has crafted two strong and complex leads in Natty and Lourdes and given readers an intricate plot that never feels forced." "A top-notch crime novel that avoids easy resolutions and is all the better for its unanswered questions." "As complex and as gritty as a Richard Price book, Blauner's first novel in more than ten years was worth the wait." "Vividly drawn and compelling...Believable...Fine entertainment for crime fiction lovers." "Over the last 25 years Peter Blauner has proven to be a master of the urban darkside, his crime novels suffused with a knowing compassion for the bottom dogs who live in the Minotaur's maze that is New York City. Proving Ground is one of his finest efforts." 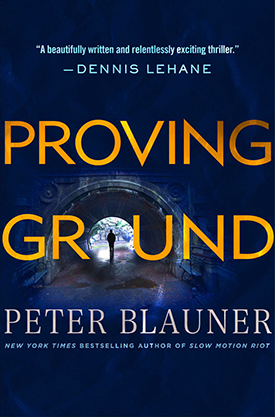 "Peter Blauner's new novel, Proving Ground, is an old-school page-turner, as war-damaged army vet Nathaniel "Natty Dread" Dresden and police detective Lourdes Robles close in on the killer of Natty's father... and, maybe, each other. Taut narration, spot-on dialogue, and sharply etched action sequences make this one a must read. I couldn't put the sucker down." 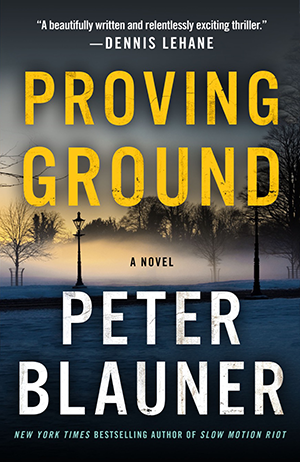 "With Proving Ground, Peter Blauner continues to prove why he's one of the most consistently bracing and interesting voices in American crime literature. A beautifully written and relentlessly exciting thriller." "Proving Ground is a startlingly powerful tale of lost lives and lost souls with a crackling crime drama at its core. No one understands the NYPD, the backroom politics of New York, nor the heart of the city like Blauner. No one." "Peter Blauner's first book in ten years, Proving Ground, is a showstopper. A tour-de-force of smart, gutsy, relentlessly entertaining storytelling that counts as one of the finest novels I've read in the past five years. Blauner has a painter's eye for detail, a playwright's ear for dialogue, and a film director's kinetic narrative vision. All combine to create a turbo-charged reading experience. Proving Ground is a masterpiece of contemporary fiction." "A new Peter Blauner novel is cause for celebration, and Proving Ground justifies the wait. This is a thoughtful, nuanced novel of crime and war and the human heart. Blauner's authentic and powerful writing is worthy of comparison to Richard Price and Dennis Lehane, and his story is coiled with emotional impact. Not to be missed."